Which slimming club is best? Which artificial sweetener should I choose? A diabetic eating chocolate may raise eyebrows amongst some people but within reason, chocolate needn’t be completely cut out of your diet. In most cases, chocolate will cause blood sugar levels to rise and in light of this it’s best to limit chocolate consumption to small amounts and to avoid eating when blood sugars are already higher than the recommended blood glucose levels. 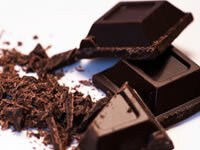 Is eating chocolate good or bad for you? Chocolate contains a number of beneficial nutrients, some of which called flavonoids are thought to guard against heart disease. However, it should be noted that larger quantities of chocolate can be disadvantageous to health in other ways. If a larger amount of chocolate is consumed, it will raise blood sugars which increases the risk of complications, of which cardiovascular problems is one. Secondly, the calorific content of chocolate is relatively high and therefore overconsumption of chocolate could lead to weight gain which also raises the risk of heart problems. How much chocolate should I eat? For most people with diabetes, chocolate is best restricted to a few squares to prevent too much of an increase in sugar levels. For people with diabetes without weight problems, chocolate can be appropriate to have before exercising. Yes, people with diabetes can eat chocolate. The main thing is to not get carried away. If you want to have chocolate, set yourself a limit before starting and then stick to the limit. It’s really up to you and what you look for/enjoy. Dark chocolate is probably the healthiest pick. It has high cocoa solids and a lower amount of carbs so it won’t affect your sugar levels as much as standard milk chocolate. Milk chocolate tends to be more sugary than dark chocolate but some people prefer milk chocolate and if as long as you’re sticking to a limit, milk chocolate’s perfectly fine. On the plus side, milk chocolate tends to be a bit lower in fat than dark chocolate so the overall calorie content isn’t much different between the two. Diabetic chocolate is chocolate that is made with ‘sugar alcohols’. The idea is that these forms of sugar have less of an effect on sugar levels. Don’t be tempted to eat too much though as they will affect sugar levels to some extent and they can have a laxative effect too. You’ll tend to find that either diabetic chocolate doesn’t taste so good or if it does taste as good, it will usually be more expensive. So that’s my guide to diabetes and chocolate. The main points: yes, you can have chocolate; stick to a sensible limit on how much and eat whichever chocolate works best for you. For more strenuous activity, however, even shorter acting carbohydrate may be required. Which chocolate is best for me? Chocolate with higher amounts of cocoa solids are best, as the sugar and fat content will often be lower as a result. For high cocoa solids content, dark chocolate is usually a good pick. Is diabetic chocolate better for my sugar levels? Generally speaking, diabetic chocolate is made by replacing some or all of the sugar content with an alternative source of sweetener, such as the polyols (sugar alcohols) maltitol and sorbitol. Polyols can have laxative effects and therefore they should not be consumed in large quantities. The effect of polyols may vary from person to person. Some people find diabetic chocolate to be beneficial compared with regular chocolate, however, many people with diabetes find diabetic chocolate to not have enough redeeming benefits. The charity Diabetes UK has campaigned to end the use of the term ‘diabetic’ with regards to food products.